Hair’s graying can be caused by activation of the innate immune system, according to a new study from the University of Alabama at Birmingham. The article, published in the open access journal, PLOS Biology, highlights the negative effects of innate immune activation on hair pigmentation cells, called melanocytes, suggesting a connection between viral infection and hair’s graying. Hair pigmentation over the course of a lifetime is dependent on the presence of melanocyte stem cells that reside in the hair follicle. 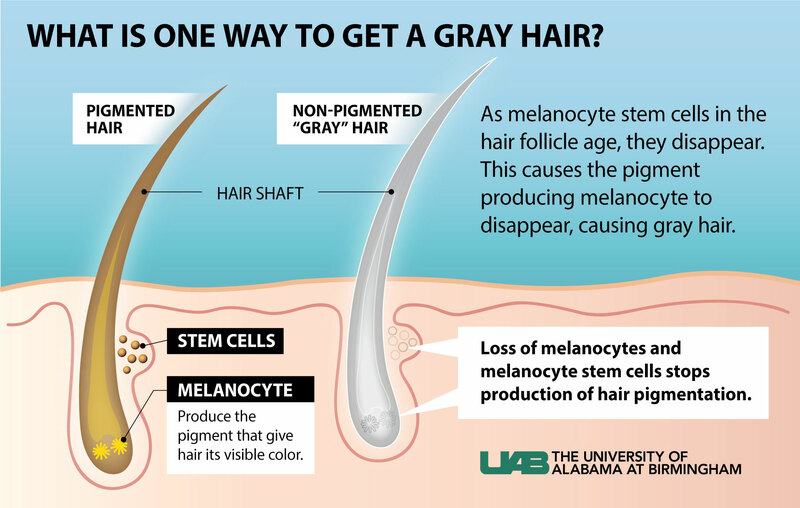 As old hairs fall out and new hairs grow in, melanocyte stem cells serve as a reservoir for the melanocytes that produce the pigment that give hair its visible color. The loss of these stem cells leads to the growth of non-pigmented, or gray, hairs. The importance of this repression is revealed in animals that have a predisposition for hair-graying. In these animals, artificial elevation of the innate immune response either through a genetic mechanism or via exposure to a virus mimics results in significant melanocyte and melanocyte stem cell loss and leads to the production of an increased number of gray hairs. When a virus attacks the immune system, infected cells respond by producing interferons. Interferons signal to neighboring cells, telling them to protect themselves. In the study completed by Harris and colleagues, it is clear that, while these signals are normally good, in excess they can also lead to the loss of melanocytes and melanocyte stem cells, stopping the production of hair pigmentation. It is currently unknown whether these observations in mice will extend to humans, but Harris speculates that this may explain why some individuals acquire gray hair early in life. “Perhaps, in an individual who is healthy yet predisposed for gray hair, getting an everyday viral infection is just enough to cause the decline of their melanocytes and melanocyte stem cells leading to premature gray hair,” Harris said. She further explains that gray hair itself is not a definitive indication of infection, and that at least in mice, there are many ways in which gray hair can be induced. This study highlights just one mechanism that helps us better understand biological contributions to the visible signs of aging. Harris’ research team and co-authors on the paper include Joseph Palmer, a graduate student in the UAB Department of Biology, and Autumne Lee, an undergraduate student in the UAB Department of Biology.